Do You Like Butter? The Buttercup Game. This is a traditional child’s game that has been played for centuries. Pick a bright yellow buttercup and hold it under your chin. If the buttercup reflects yellow onto your skin, then you are said to like butter. Actually, University of Cambridge researchers have found that it is the bright glossiness of buttercups that causes the intense yellow reflection. 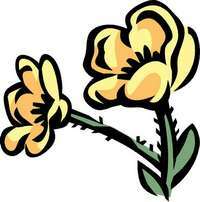 See why buttercups reflect yellow on chins for a more detailed scientific explanation. There are quite a few variations of the words to this song-and-circle game for young children. Have all the children in your group stand in a circle with their linked hands held up high. One child is chosen as the leader. The leader then weaves in an out of the linked arches while the words to the song are sung or chanted. When the final word “me” is heard, the leader chooses the child who stands closest, who will then become the new leader. The new leader holds hands with the first child and leads them both in and out of the circle. Each time the song ends, a new child leads the line until one child is left while the rest of the children circles around them. To continue the game, the last child becomes the new leader of a newly formed circle.